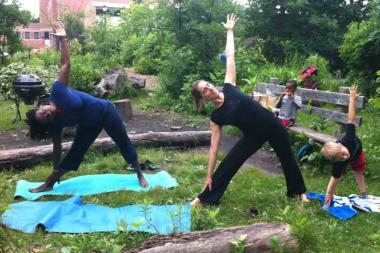 Bloom Yoga founder and director Kerry Maiorca (center) leads an outdoor yoga class at Waters Elementary School. LINCOLN SQUARE — Salute the sun literally and figuratively during Bloom Yoga's free outdoor class Sunday morning. As part of the studio's Bloom All Summer series, instructors will lead a class 8 a.m. to 9:15 a.m. on July 21 at the Lincoln Square Community Garden, located at Western and Lawrence avenues, adjacent to Walgreens. Given the recent sweltering temperatures, consider the class a bonus introduction to hot yoga. People of all levels of experience are welcome, including beginners. Bring a mat or towel if desired and wear comfortable clothing. In the event of rain, the session will be canceled. Another free class is scheduled for the same time and location on Aug. 18. Bloom also offers free community yoga classes at 5:15 p.m. every Saturday at the studio's location at 4663 N. Rockwell St. Community classes are taught by Bloom's teacher trainees and are recommended for students who already have some familiarity with yoga.